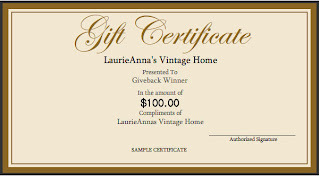 LaurieAnna's Vintage Home: WE HAVE A WINNER! 5,000 Likes on Facebook and a Giveback! WE HAVE A WINNER! 5,000 Likes on Facebook and a Giveback! Alright my friends, you amazed me with 202 comments for the giveback! That's a record in itself for us! Thank you for visiting the facebook page and reading the blog....it means so much. Congratulations Lori! Email me at sales@laurieannas.com and we'll get you all fixed up! Yessiree, thanks to you we just hit 5,000 likes on our Facebook page! Not bad for a page that's only 9 months old! Thank you so much for supporting us as you do! 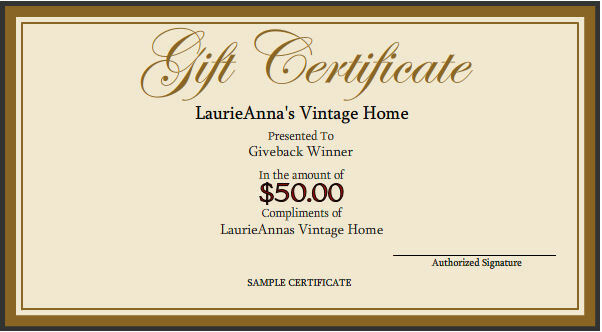 We're celebrating this big milestone and thanking you with a giveback for a $100 LaurieAnna's Vintage Home gift certificate! It can be used at our physical Shoppe and also at our online store. You need only leave a comment to enter and earn a chance to win! Note: If you do not have a user profile, please be sure to leave an email address so we can contact you if you win. Thanks so much from the entire crew here at LaurieAnna's for "liking" us! 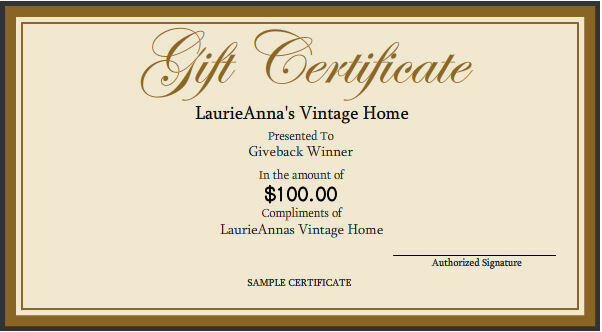 Thank you for your very generous give away Laurie Anna. Love all your merchandise pics and can't wait to make a road trip with my girlfriends to see it all in person one day soon! Fingers crossed! That is awesome! 5,000 likes in less than 9 months. Congratulations! I love your blog! Congratulations and thanks for the giveaway opportunity. just found you last week but i love love love your style! :) will be a frequent visitor! Congrats!! Can't wait to see what the future holds. Congratulations! I love your blog and looking forward to "Farmhouse Friday"! Congrats! I love your blog, and my daughter and I are headed to Canton this weekend! YEA, see you soon. What a milestone! Thanks for your wonderful store. Please enter me in the giveaway. Thanks for a great blog and store. Congratulations. Please enter me in the giveaway!! This is a generous giveaway! I can think of a "hundred" ways to make use of it!!! Thanks for the opportunity to win it! Congrats on the 5000 likes and thanks for the generous and fun gift certificate. I remember talking with you about FB in your store. 5000 is such a short time...that's amazing but then again you and Willie are amazing! Gosh, if I won, I'd be tempted to take a road trip to Texas with the gift certificate in hand just to see the inside of your store! Congrats on your huge success with 5000 likes! Oh what fun that would be. Congratulations. Me, me, me, me, ME, pick ME!!!!! Of course 5000 likes. See you this weekend! Love your site! Have you thought of traveling to McKinney? Love the store and seeing what's new...just wish I could get over there more often! Love love love your shop! Looking forward to Farmhouse Friday. I have had 2 Victorian homes and will always be an "old house person". Now you are 5,003....I just liked you on facebook. I thought I had already done so....but no. I'd love to win this certificate. Congrats on this milestone you have reached! Love your farmhouse also and cannot wait to see what the future holds. Thanks for the chance to win a gift certificate! Blessings! What a great giveaway! You're the best! Congratulations on 5000! That's wonderful. Love your shop. Thanks for this generous giveaway! What a great milestone!! 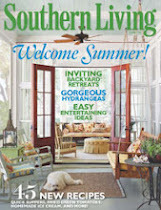 Love your style and am so looking forward to seeing your farmhouse done Laurie Anna style! I would love to enter your fabulous and generous giveaway. Congrats on your FB likes. Enjoying following along to see what all is happening at the new OLD house. Can't wait to see every Friday's posts...Moving soon and hoping to get an OLD and charming home myself with a little land to farm. Thanks for sharing your adventures with us! 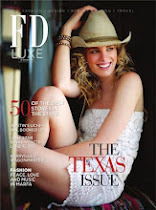 Thank you, hope to see you soon, love the blog and cant wait to see what you do with the farmhouse. Congratulations! I can't wait to visit your store in Canton! Can't wait for your new farmhouse blog!!! Ohh congratulations! Can't wait to see what wonderful things you do with the new farmhouse! 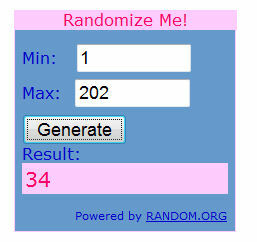 Thanks for the chance to win some of your loveliness! Congratulations...all your hard work is paying off. I'm so excited for you about the new house too. I love the new header on your page. Congratulations on your milestone! I would be beyond thrilled to win, though I'm not sure what I'd pick as it's all so amazing! I love your shop and thanks for the great giveaway! I just recently found you, and I am totally inspired! Congratulations on hitting 5000 likes on FB! oops..I forgot to leave my e-mail! Wow, 5000 likes, how cool is that!! That just shows you how many people have great taste. I so love your new home and look forward to seeing how it progresses. Thank you for sharing you blog with me, I so enjoy it. 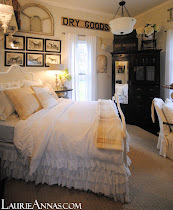 Love your store ... a recent purchase has been the inspiration for a bedroom makeover. Great blog, too! Best of luck on the new house! Wow! 5000! Great giveaway! I'd love to win. Congrats on the 5000 likes on Facebook :) You know I'd have a blast spending that! CONGRATULATIONS, Laurie!!!! Wow! That's incredible - but certainly not surprising! We ALL love you, love your farmhouse, and love your style, girl! :) Thank you so much for this wonderfully thoughtful giveaway! Now.....tell me more about Farmhouse Fridays....??? Count me in!!! Thank you for this wonderful offer! I am so excited about Farmhouse Fridays! You have an amazing talent! I am ready for a Laurie Anna's in Georgia- A franchise! We just don't have some of your awesome items here! Thanks! I was in the store today & visited with you when you rang up my merchandise. I had been in once already, & my husband said to go back & buy more things if I wanted. I am so happy you have your newly purchased farmhouse to make it the way YOU want it to be. I never miss coming in and purchasing so many beautiful and unique items. Congrats on 5,000 "Likes" on FB. That is great!!!!! Can you say Bliss?? To shop at my fav store with a gift certificate...wowzers!! PS I am a follower for sure!! I will be keeping my fingers crossed! Love, love, love your store! Thanks for the wonderful blog. You are sooo generous! !I love your store!! Congrats on the 5000 fb likes and thank you for the generous give-away! I just stumbled upon your blog and your fantastic little store. I've already ordered several items and will surely be a repeat customer! Congrats on your 5,000 "likes"! Congrats on such a huge milestone! Well deserved for sure! I found out about your shop via my sister . . . hope to visit soon . . .
May 5,000 be a mere drop in the bucket! Congrats!!! Love your shop. Kinda wish I still lived closer but you are on line.. thanks for that. Great store, creative store, most interesting blog! Yay! Congrats! Y'all are wonderful- here's to 5000 more! I have been to your store on several occasions and I am blown away every time. Thanks for the chance at a great giveaway! Love all your stuff on your blog and your store looks just great!! Hope I win!!! Can't wait to see more on the 'new' home. Enjoyed visiting your store on Saturday. Congrats on the milestone, hope I win! Wow, so cool! Congratulations and thanks for such a generous gift! I have so many things I want at your store, this would just get me started! Thanks for giving us the chance to win such a nice gift! Oh, I want to win this! Congrats to you, I love your store! 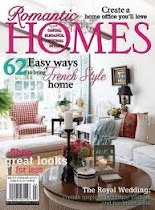 I am so excited for you Laurie Anna and love reading about your new farmhouse! Thanks for the chance to win, I love your blog! Congrats LaurieAnna! I hope this past weekend was a fabulous sale - we were in Colorado. Wonderful giveaway! Congratulations! And Congrats on the new house. I can't wait to see it transform! Congratulations on your first 5,000 "likes" (should be "loves"). I just recently discovered your blog and I'm totally hooked. What a great way to start my day! Congratulations! What an exciting feat. Best wishes to future endeavors. As a French fashion house founded in 1854, LV has improved greatly and acquired countless lovers across the world. Recent years, there established many online Louis Vuitton Sale, aiming at making people¡¯s shopping more convenient. You don¡¯t need to go out of your house and wander about to find the LV Bags you like. Additionally, special discounts of the goods such as Louis Vuitton Purses are offered everyday. Hurry up! Wow! You have an awesome shop, and blog, and style....and everything! Thank you for the chance to win!! What a great giveaway! Congrats to you! Love your blog and shoppe! Your house will be so amazing with the lighter, simpler palette! Hope you keep the chandelier with the lustre crystals hanging--so gorgeous! And wouldn't haint blue be perfect for the front porch ceiling? Love it! Congrats, and thank you so much for the opportunity to win! May you and your family be blessed with much joy and happiness in your beautiful "new" home! I love your blog & your shoppe! Congrats on the milestone and on The Farmhouse! 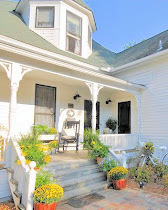 I loved watching the transformation @ 5th Place & can't wait to see the changes at The Farmhouse...I love your style! That is quite a land mark! Congrats! You are one of my favorite shops and I love your blog. Congrats on being "liked" so much! Thanks for hosting such a generous give-away. Congrads to You! May you only have continued success!!!! I just visited your new store for the first time last week and I would love to return with this gift certificate in hand! What a generous giveaway, please enter me. thank you! I just found you and I really need to win that gift certificate because I only live 30 miles from Canton and I will definitely be visiting your shoppe! Congratulations on your success!! OMG!!! I would p---- in my pants if I won this give away. I love everything you have and create. I love love your new home and cannot wait to read your blog on updates. Well, I like to congrats and appreciate for the giveaway opportunity. It is best news for every blogger reader. I like your new home and waiting for update news. WOW...Would I ever love to have this gift certificate to get me started shopping! Love, love, love your stuff! Your shops look amazing and I hope to visit when cooler weather (September? Really) comes our way! Can't wait to get back to Canton and to your Shoppe! You are the talk of the town where I'm from and I've even seen you featured on other friends blogs! Would love to win! Glimpses of your shop are "to die for"!!! I would love to shop with you and soon!!! Wow, what a generous give away. I am so excited to see the DIY projects you have in store for your new farmhouse. Missed this past weekend and it was so hard not to be able to come. Next month for sure! Just stumbled upon your shop a few months ago and OH MY GOODNESS!You have a true gift, girl. Wonderful blog, I came over from Anne lorys Fiona&Twig just now. Iloveyourstyle! Congrats! Thanks for such a great giveaway. Oh my, I want to win this! I tweeted and facebooked. Thanks for the chance to win the gift certificate! I have a vintage house built in the late 30's. I always wanted an even older home but it is not to be so I enjoy the one I have so much even to decorating the kitchen which has been redone in the 70's but tastefully in aqua and red and white. There is nothing as homey and welcming as an old kitchen. I even have the old wood cookstove for it! Love your store and love the Merchant Cabinet! Would love to win your giveaway. Oh my goodness, the things in your shop that I would love to have. I've been having to save my pennies lately. Love to win this! If it's not too late, I'd like to join in! :) I just "found" you through Brenda at Cozy Little House. What a generous giveaway - thanks and congrats on 5000 followers! Congratulations! Ohhh, I'm drooling over all the things I could buy with that giveaway! My mom just introduced me to your blog and I'm loving it! Congrats, this is just the beginning of many good things to come I'm sure. I especially loved the blog post about the shop dogs. 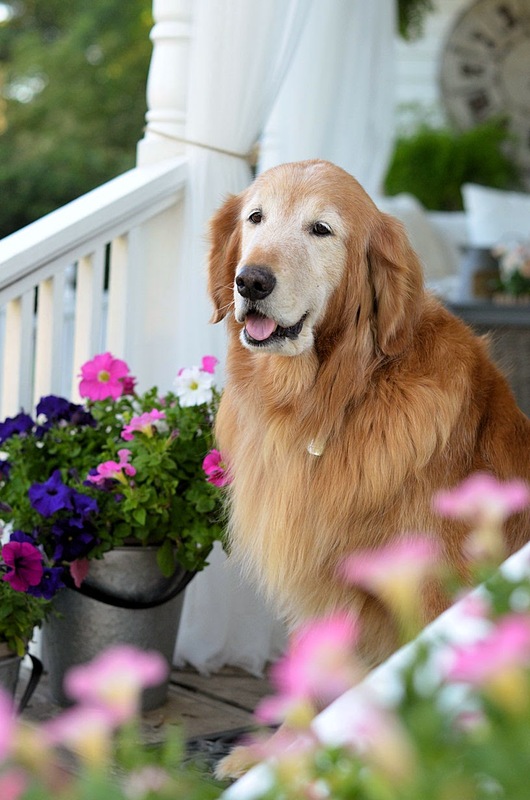 Your golden reminds me of my sweet baby that we just lost awhile back. Thanks for sharing these fun extras wisth us! LOVE your blog and the shop! Oh I just love your store!!! It's like a breath of fresh air...Everytime we come to Canton, LaurieAnna's is our first stop!!! Gorgeous,clean,and classy!!! Congrats on the FB milestone and thanks for the chance to win! I love your blog and swooned over your lates farm house post because I am in the middle of renovating my kitchen. 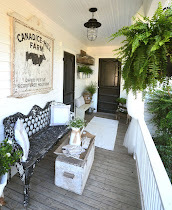 I am doing the farm house theme as well and have been looking at Pinterest for some interest as well. Anyway thanks for the chance to win your fabulous give-away! I am keeping my fingers and toes crossed!! yay! congratulations Laurie :) I hope I win!!! Not like--love!! I absolutely love looking at the pictures of your beautiful shop and the farmhouse pics,too! Please pick me :) I have a trip planned over to East Texas in the fall and can't wait to stop by! LOVE, LOVE, LOVE LaurieAnna's! Found y'all online about a year ago, and I have read your blog ever since! Love it! Thanks for everything you do and all the hard work and hours you putbinto your store. A friend of mine told me about you store and I immediately had to plan a sisters and moms trip to visit. We came in July and boy was it hot. But SOOOO worth it. I hope to come back one day! Thanks again for everything you do!! Just found your site. LOVE IT!! Really inspires me with my old home. I wish I was able to shop at your Canton store! I love your online store - there are so many lovely things there! Congratulations on all those fb likes! Sweet giveaway. I am a new follower! I love farmhouse style and am excited to find your blog and enter your giveaway! Thank you! I just discovered you guys on my last trip to Canton! I would love to win! Thanks so much for the chance at this great give away! I've heard of your lovely Shoppe from Brenda at Cozy Little House, but it's too far away for me to visit. I didn't know you had a blog and have now signed up as a follower. PLEEEEEEEESE pick me!!! Your things are so lovely! Would love to win!!! Found you on Fiona and Twig...Would love to visit your store!!! I found you on Cozy Little House and I think I've fallen in love!!! I have a new farmhouse built to look old and the envy is starting again...I love old farmhouses and I look forward to seeing the transformation of yours! And I would SO love to win a gift certificate for some of the beautiful things in your shoppe!! Thank you for such a generous giveaway. love your shop, love your blog! love your facebook page! congrats on all your successes! Congratulations LaurieAnna...that's a LOT of likes but I can certainly understand why! Also congratulations on the purchase of your beautiful farmhouse...what a beauty. I can't wait to see what you do with it...I know it will be gorgeous! I hope your weekend was a good one and have a wonderful week! I'm new to your blog but already intrigued. I will be following as you make over your farmhouse. Congrats! What a lovely blog and the music is great! Thanks for sharing. Love reading the updates/happenings. Just discovered your blog...love it!!! Please enter me in your giveaway!!! I just know I am one in 5000! I could so easily live in that house! Oh my... I am green with envy! I would love to win, thanks for the giveaway! Wish I could go to Canton! One day I'm coming to Texas and see your shop in person! It would be so much fun! Thank you for the chance to enter! Your stuff is so great! I can't wait to visit you for the first time next month! 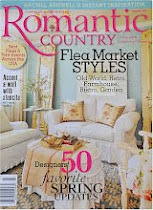 Afraid I might need to buy one of everything :) Loving the shabby chic, rustic chic look and all your blog post! Very inspirational! 5,000 likes is PHENOMENAL!! Congratulations!! You are such an inspiration! lovelies abound. Congratulations! I would love to win this! Love your store and your blog! Would love to win! I would be over the moon if I won this! Congrats on the amazing Facebook growth, but it's not surprising at all! I love your style! 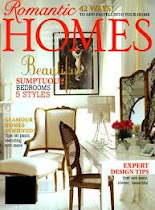 Your new home is beyond lovely and it's exciting to see the journey on your blog. Congratulations on the 5000 likes, should be 5000 loves!